Enjoy the beauty of Cabo San Lucas onboard this fully equipped PRIVATE 42' sailing catamaran! Join us for snorkeling, a sunset cruise, whale watching, a booze cruise or simply pleasure. This catamaran is totally PRIVATE, just for your group. Of course your friendly English speaking crew will be waiting on you throughout the day, serving you drinks and having fun. 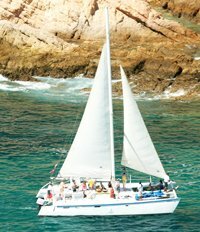 We can sail by Land's End, including Lovers Beach, The Arch (El Arco), the Sea Lion Colony, and Pelican Rock on our way to beautiful Santa Maria Bay. Here clear blue waters with abundant sea life awaits us as we enjoy snorkeling with colorful tropical fish. If you prefer, you can stay dry and lounge on the deck, basking in the warmth of the Los Cabos sunshine. If you are visiting between December and April every year, you have a great chance of seeing humpback whales, either as part of a sunset or snorkeling cruise, or on a dedicated whale watching tour. Enjoy sailing with the wind, cocktail in hand, and the privacy and freedom of an exclusive private charter. What a wonderful memory in Cabo! Available for 4-Hour or 2-Hour Trips. Music for your Best Dance Moves! Your Snorkeling Trip Includes one of these Tasty Options! Snorkeling Trips include Open Bar and Lunch. Up to 30 People Same Price. Sunset Cruises include Open Bar and Snacks. This charter is a top-seller and one of a kind. So, to make sure the date you want to book is still available, give us a call or chat with us! We'll be happy to help you! Thanks! I already checked, my date is available, and I'm ready to book!